Here is a quick overview of our current Residencies, there is more information below. Wednesday - 8.30 - Love & Rockets (Lark Lane) with Sueyo on vocals. Saturday - 8.30 - Petit Cafe Du Coin with Baiana - Brazilian Jazz. We have a weekly residency at the hip Petit Café du Coin. This place has a great vibe and is just like a little piece of the Marais on Merseyside. Please arrive early to guarantee a table. residency at "The Cali" in Liverpool. Always FREE ENTRY it is one of the best venues for Jazz, Roots, Americana and acoustic music in the city. You can now catch a scaled down version of Brazilian band Baiana with Micky & Karl joining the fabulous Laura Doyle fusing Brazilian Bossa Nova with French Gypsy Jazz. A new kid on the block for Lark Lane! Polidor 68 the place with the French vibe, great food and cocktails. Expect Django, Waltzes and 60's inspired jazz with Micky & Karl in duo format. A new collaboration for us with the brilliant Baiana fusing Brazilian Bossa Nova with Gypsy Jazz. We're back at one of our favourite pubs the wonderful Ma Boyles. Always a swingin' night. This promises to be an amazing day of music for the Bank Holiday weekend and best of all it's free! We will be joined by some of the North Wests best jazz musicians and we hope you can come along too. Micky & Karl are thrilled to be joining violinist Chris Hayward and Rae Owens for Fest Jazz in Chateuneuf du Faou in beautiful Brittany. Exciting news! There is a new Jazz night in Liverpool - Sunday Swing Club at Frederiks! Every week you shall be entertained by one of Liverpool's finest Jazz bands for free! There are also plenty of drinks promos to keep you refreshed. We will be joining the wonderful Lucy Lockwood at Nantwich Jazz Festival, always a swinging affair. 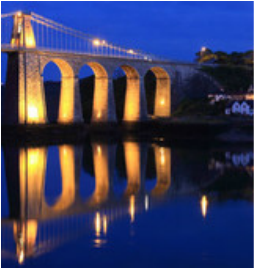 We are delighted be returning to the wonderful March Manouche festival in beautiful Menai Bridge, Anglesey. We are playing at the main festival on the Saturday evening and also at the fringe in the afternoon. It's sure to sell out quickly so please book well in advance. We are thrilled to have the opportunity to share the stage with a living legend of the Gypsy Jazz scene. Romane, who is a resident of Samois where Django spent his final years, has influenced a generation of musicians on the Paris scene and beyond. We are very lucky to have him in Liverpool for this special event alongside our good friend Daniel John Martin. A pre-Xmas festival you say? Yes please! We are joining some great acts at Celtic Bazaar's Festival in a Night. Located at Handymans on Smithdown Rd it's sure to be a cracker. There is a little piece of the Marais on Merseyside. This wonderful cafe bar serves excellent wine and delicious cheese boards, they also host a gypsy jazz band! ​Back at The Blackburne House Bistro. Great freshly prepared food and live music by yours truly. Book a table in advance! Our friends at Mono-Tone have invited us along to play at Buyers Club 2nd Birthday bash. Live Jazz, Vinyl & a roast dinner! Jacknife Jazz present - Djangojam in the Lone Wolf speakeasy at EBGBS Hosted by yours truly. Bring your instrument and get involved. We're back at the wonderful Workshop in Waterloo for an evening of Jazz, Eats & Beats. It's an intimate setting so why not book a table? A new gig for us at this great local north Liverpool venue. The Workshop serves up craft beers and small delicious plates alongside you friendly neighbourhood Gypsy Jazzers. Tuesday 25th July 8pm Bookings advised! Sunday session at super cool hangout Sound food & drink. We are delighted to be performing for all the Gin lovers for 2 nights at the beautiful Lutyens Crypt in Metropolitan Cathedral. 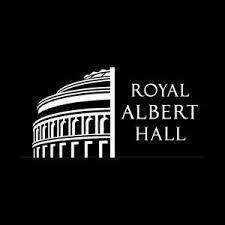 We have been invited to the world famous Royal Albert Hall for their 'Live Music at Verdi' series. We are thrilled to be performing at Mono-Tone Jazz in West Kirkby, a cool, post modern event with live jazz, food and vintage vinyl. Micky & Karl will be playing a 1940's set in The Epstein theatre bar before the performances of a new Liverpool musical. Set during the blitz the poignant comedy musical contains 18 original songs and should bring back great memories for those of a certain age. Tuesday & Wednesday 29/30th Nov - 18.30 Click for tkts. Everyone is welcome to join Liverpool's first ever Gypsy Jazz Jam hosted by yours truly. All instruments and levels welcome for what we hope will be a monthly event. We are really pleased to be back at Frodsham Guitar Club once again to see some old friends. We are very excited to hold a workshop alongside Daniel John Martin as part of Southport Jazz Festival. Daniel John Martin and The Manouchetones performing together for the first time at Matt & Phreds. Did we mention the free pizza? Our friends over at ParrJazz have invited us to perform at their weekly night in Frederiks. Liverpool's best Jazz night and super cocktails. what more can you ask for? 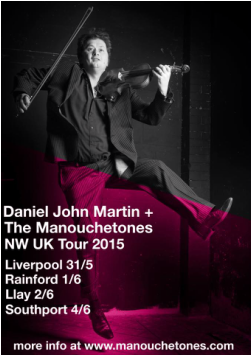 Our good friend, the amazing violinist/vocalist Daniel John Martin will join us for a series of dates around the North-West, a performer not to be missed! 31/5 Liverpool - Click here. 2/6 Llay North Wales - Click here. 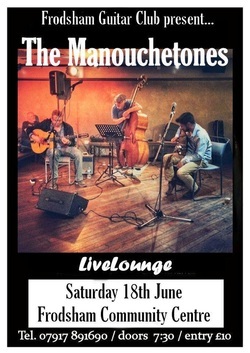 Really excited to be performing at the inaugural March Manouche - Gypsy Jazz Festival in Anglesey, North Wales. Micky will be forming part of The Robin Nolan Trio for a special one off event at the newly formed Frodsham Guitar Club.